Public Art Community Engagement (PACE) paired artists with neighbors to define future public art projects that fit wants, needs, and desires of the people that will see or use it the most through art-making-centered conversations. 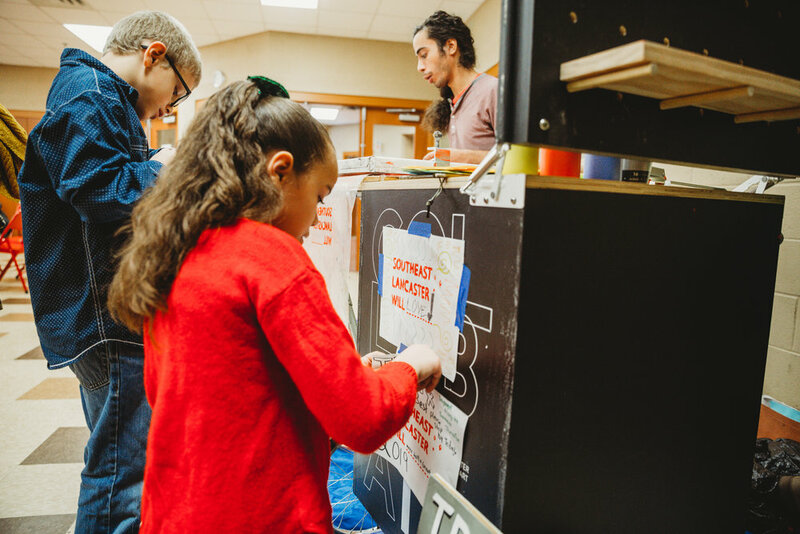 From October - December 2018, artist Josh Graupera used a roving pushcart, inspired by carts used by local Latino entrepreneurs selling water ice, fruits, was a new mechanism to further community-centered dialogue and provide outreach about the PACE program. The cart opens to become a printmaking station and serves as a community information exchange hub. Josh worked from the cart at various community events and also roamed the streets in Southeast Lancaster to start conversations with neighbors there. Critical questions about what makes a community, a home, a neighborhood will anchor the discussions. Through this interaction, areas for improvement and ideas are identified by participants, as well as ways to bolster projects already in the making. In the years to follow, Lancaster Public Art will implement public art projects based on the community input. Artists again work with the community to access the effectiveness of the new projects and gather more input for future. Download our first zine for free here! Many Southeast organizations host holiday celebrations, including The Mix at Arbor Place, which hosted their first Annual Family Holiday Breakfast on December 22nd. And wow, it was a huge success! About 75 people came to share a breakfast catered and donated by Catalina's on Orange and opened gifts provided by Donegal Insurance, Rocky Springs Entertainment Center and VILLA. Each kid also received a custom sketchbook and pencil from me! 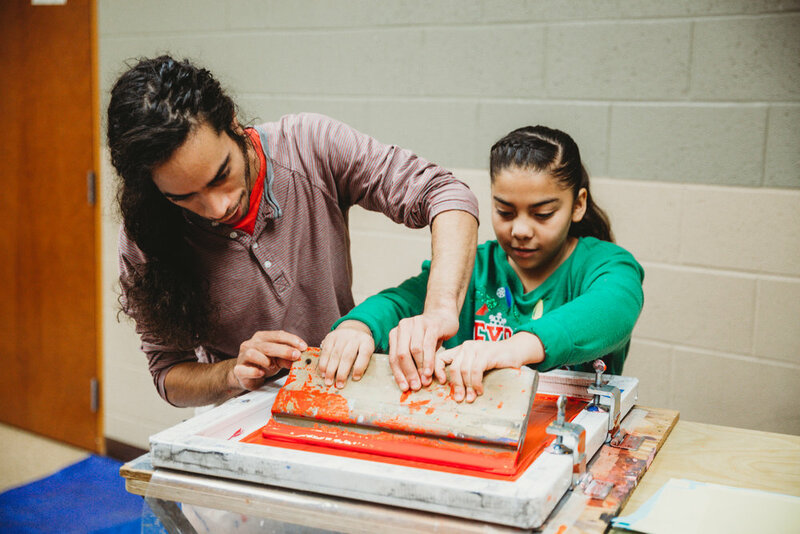 Thanks to Mr. Luis, Mr. Joe, Michelle Johnsen and Ms. Marisol for inviting PACE to screenprint with the kids! Check out Michelle Johnsen’s photos from the event here! If you’re a teen looking for a great place to hang or a family looking to provide more activities for your kids, check out the amazing cultural programs The Mix offers: What’s For Dinner, After School Program, Urban Arts, Strong African American Families and so much more! On December 12th, Tech Centro, a dual-language job-training training school invited me to talk to participants from their weekly job fair and ask what they’d like to see in the Southeast in the future. We spent a lot of time talking about the hurdles folks face trying to find a well-paying jobs as well as what kind of businesses could exist in the southeast. A few ideas stood out: more business owned by black people, a cafe, a free art school, dental services and more programs that help folks in recovery find work. Some folks were even brutally honest--expressing nihilism that things probably wouldn’t get better for the Southeast, or for people of color, in general. However, optimistic or not, folks do believe in working their hardest each day for the lives they want. Big thanks to Michelle Johnsen and Silas Crews for documenting the event. Check out photos on Michelle’s website! Case Management: Provides services through information and referrals and become an advocate for students. As Thanksgiving approached, Crispus Attucks, Lancaster County’s longest serving African American Civic Association, hosted a wreath making party to get folks into the holiday spirit. PACE came by to talk to people about what traditions they’d like to see in the continue in the future, as well as show folks what ideas the neighborhood as been generating through the mobile art cart. Did you know that Crispus Attucks has a historical plaque installation in the community space? Go check it out! It’s a gem of a resource that lays out the figures and change-makers of the Southeast (present and past). Anyone interested in getting an overview of Southeast Lancaster’s history should spend some time with this work. 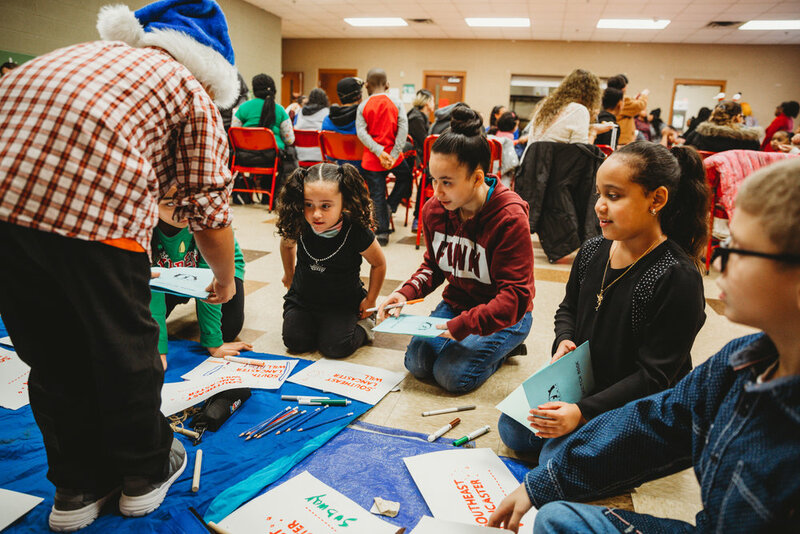 Check out the photos from the event below, and consider donating to Crispus Attucks this holiday season so they can continue the amazing community building services they provide. When it comes to where we get our food, Lancaster City and County have both had a wild ride. Last year, Giant’s Walnut Street location closed. Earlier this year, Darrenkamp’s Supermarket closed its doors as well. However, earlier this year, Wegman’s and Whole Foods opened their doors to Lancaster County residents. But what does all this turnover mean for folks living in the city? Saturday morning about 30 people gathered at Conestoga Plaza, a commercial center recently built by the Spanish American Civic Association (SACA) for the grand opening of Brothers’ Grocery Max. Lancaster Newspaper writes, “When Giant closed its Lancaster city grocery store in May 2017, the opportunity for the new, 10,000-square-foot store became more apparent. You can read the Lancaster Online article about the opening here. As Smail Business Saturday approaches, consider putting at least 10% of your shopping budget into a business in Southeast Lancaster. When you support a local small business, you’re also supporting the local infrastructures that make that special place run. Check out the map below to see which grocery store is closest to you. PACE spent two days outside Martin Luther King Elementary (corner of South Duke and North St) talking to families about their ideas for Southeast Lancaster’s future. One theme stretched across every group I talked to: Fortnite, arcade games, and a communal place to play them. Seems like a win-win. And now that video games are reshaping the way educators are thinking about STEM, why not invest in a creative space for folks to embrace this creative technology. Fall is coming in quick the weather is still beautiful for screen printing in the open! PACE spent about 3 hours talking to folks in the neighborhood as they came and went into San Juan Bautista Church (largest Spanish Catholic Church in the area). Two really amazing conversations emerged—one from a kid and one from an elder. The former focused on an idea I hear from kids all the time…”I wanna become a YouTube Vlogger.” or “I wanna be a professional Fortnite gamer!“ So, with that as a launch point, we talked about the importance of video games and digital communities are for today’s youth. “What if there was a center where people could come play video games together and learn how to run their own YouTube channel?“ My mind was blown. It’s a dream I’ve always had as a kid. The process for folks to expunge their records is need across the country. Many people who’ve gotten in trouble as youth or young adults are forever barred from certain employment, housing, and civic opportunities. While programs are available, many are incredibly costly in time and money. You can check PA CareerLink’s Calendar for upcoming expungement clinics in Lancaster County. Lancaster City’s Love Your Block program invited Lancaster Public Art and PACE to their Howard Ave Block Party. It was a fantastic way to spend a rainy day in the neighborhood. PACE unveiled its mobile art cart! This has been a labor of love for the last few months and we’re excited to take it to the streets! Throughout the block party, PACE talked to 25 folks about their future visions of Howard Ave and the Southeast in general. Check out the photos to see some of their amazing ideas! PACE kicked off the second round of engagements with a table at Brightside Baptist Church’s Fall Festival! 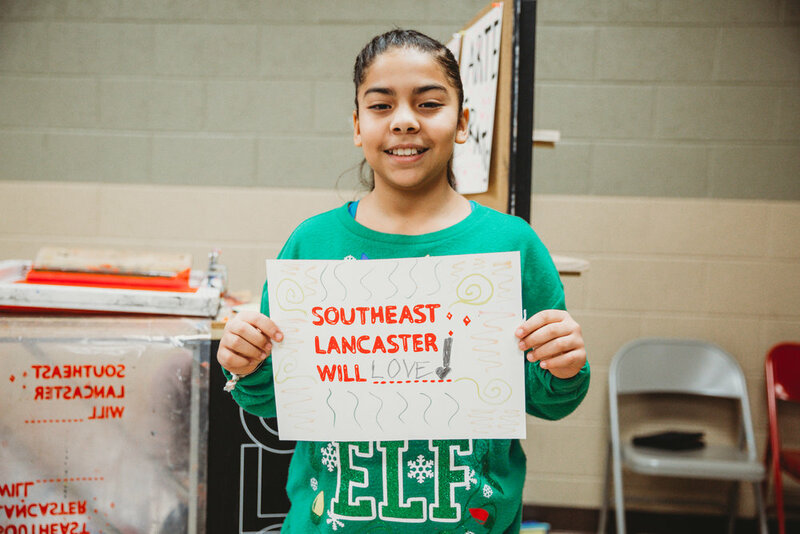 We started a new project, “Southeast Lancaster Will_________,“ which asks folks to envision what our neighborhood will have, will want, will be. Keep an eye out for us through the fall and let us know what your future vision is! The third PACE community meeting held at San Juan Bautista gave everyone the opportunity to be city planners for the evening! Community members indicated on small maps, places in the neighborhood where a new space can be constructed or where one exists and could use some love and support. Drawings of dream spaces for the Southeast followed the indications on the map. Most of the ideas for public spaces were transferred onto the community dream map. PACE held its first community meeting lead by artist Josh Graupera! The meeting took place at Crispus Attucks on June 25th. 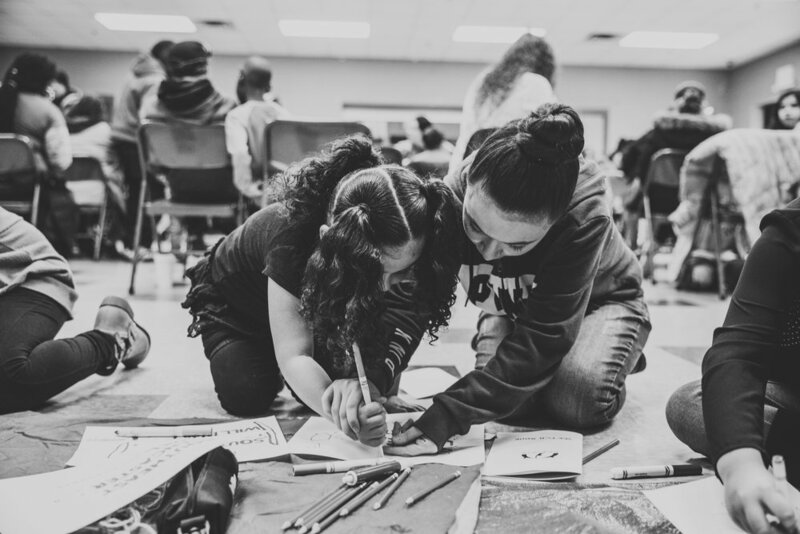 Community members that participated created a timeline of their lives structured around moments that have shaped who they are today through collage, drawings, and creative writing. Graupera also introduced a new community tool, the community dream map. On this map community members were able to write down things they wish to see in their community, such as art therapy and a green thumb community team.